With the 50th anniversary of the March on Washington quickly approaching (Aug. 28), USF is hosting a commemorative event on Tues., Aug. 20 at 6 p.m. The event is free and open to the public. 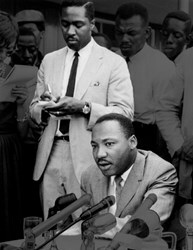 Clarence B. Jones behind Dr. Martin Luther King Jr.
“Dr. Jones is a living legend,” said Mary J. Wardell-Ghirarduzzi, vice provost for Diversity Engagement and Community Outreach at USF, who worked closely with Mayor Lee’s office to organize this event. The University of San Francisco (USF), in collaboration with San Francisco Mayor Ed Lee and The San Francisco Human Rights Commission, will host an event on Tues., Aug. 20 at 6 p.m. to commemorate the 50th anniversary of the March on Washington and Dr. King’s “I Have a Dream” speech. 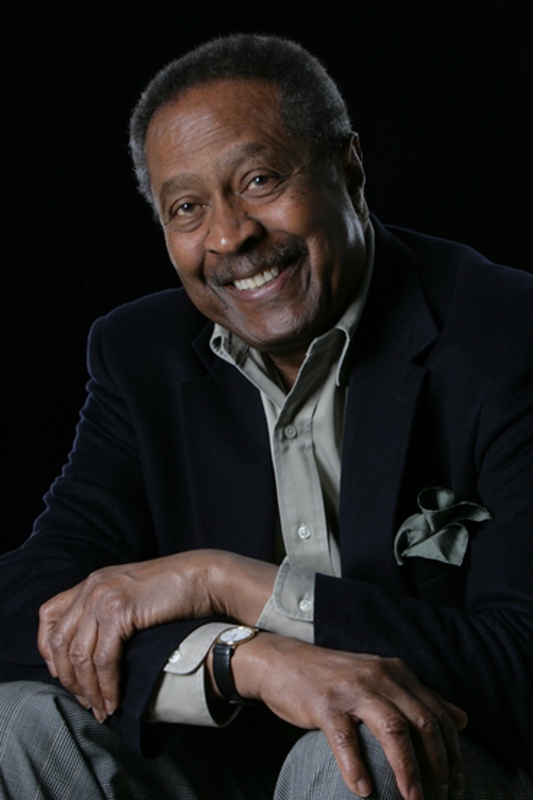 Clarence Benjamin Jones Sr., a former speechwriter, attorney, and advisor to the late Martin Luther King Jr. will be the keynote speaker and be presented with the HEROES award by The San Francisco Human Rights Commission for his work with Martin Luther King Jr. behind the scenes at the March on Washington and in the Civil Rights Movement. During the event, speakers will reflect on Dr. King’s legacy and speak about progress and setbacks in racial equality since the 1960’s. A brief presentation of speakers will begin at 6:00 p.m., followed by an opportunity to meet Dr. Jones. The event, taking place in the University of San Francisco’s McLaren Conference Center (2130 Fulton Street, San Francisco, CA 94117), is free and open to the public. Complimentary on-campus parking is available. Jones, a product of early childhood Catholic education himself, is co-author of “What Would Martin Say?” and “Behind the Dream: The Making of the Speech that Transformed a Nation.” In 1967, he became the first African American to become a partner in a Wall Street investment-banking firm, and in 1999, he was awarded White House Letter of Commendation by President Bill Clinton for his 1963 civil rights work in Birmingham, Alabama. Jones was the chief negotiator during the 1971 Attica uprisings and massacre, his timely copyright of King’s “I Have a Dream” speech provided intellectual property protection to that historic document, and he personally smuggled out the “Letter From Birmingham Jail” on toilet and other scraps of paper. Jones will again teach “From Slavery to Obama” to USF undergraduates this semester. The course will include readings, lectures, and guest speakers, focusing on the people and events that shaped America’s efforts to abolish slavery, address its historical consequences, and create a society based on racial equality. For his extraordinary work, the University of San Francisco awarded Jones with an honorary doctoral degree in Dec. 2011. The University of San Francisco is located in the heart of one of the world’s most innovative and diverse cities and is home to a vibrant academic community of students and faculty who achieve excellence in their fields. Its diverse student body enjoys direct access to faculty, small classes, and outstanding opportunities in the city itself. USF is San Francisco's first university, and its Jesuit Catholic mission helps ignite a student’s passion for social justice and a desire to “Change the World from Here.” For more information, please visit http://www.usfca.edu. To learn about USF’s event on Tues., Aug. 20, or to request an interview with Dr. Jones, please contact Anne-Marie Devine, USF’s senior director of media relations, at (415) 422-2697 or abdevine(at)usfca(dot)edu.